Heads up if you're looking for a big-screen all-in-one on a small-budget: MSI's 21.6-inch AE2220 is slated to arrive in November for $700. The multitouch screen takes advantage of Windows 7's touch-capabilities, and the AE2220 also has its own custom touch-optimized interface. Different icons bring you to "Work," "Fun," "Tool," and "Web" program menus. Powered by Nvidia ION graphics, the screen supports a resolution of 1920 by1080 pixels--1080p widescreen resolution, in 16:9 ratio. Unlike many all-in-ones these days, the Wind AE2220 does away with the underpowered Atom processor in favor of either an Intel Core 2 Duo or Pentium Dual core chip. The $700 model will have an Intel Core 2 Duo T4300 processor, 320GB hard disk, and 4GB of DDR2-533 memory. Ports include HDMI- and VGA-inputs, 6 USB 2.0 slots, an e-SATA port, and an Ethernet port. 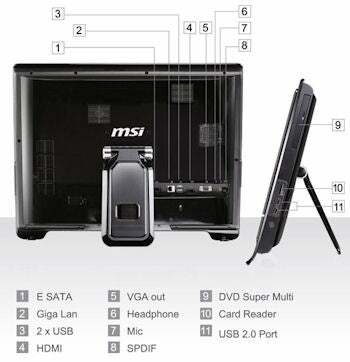 Staples like a DVD writer (tray-loading), multi-card reader, built-in Webcam and 802.1n Wi-Fi are also included. One selling point that MSI is pushing is energy savings. It says the AE2220 meets the requirements of the latest ENERGY STAR Version 5.0, as well as low-power requirements set by the EPA, and claims that the Wind Top saves up to 80% power consumption in comparison to a regular PC. Either way, the AE2220 (27SUS) is a slim and stylish all-in-one that might make a great family desktop. Stay tuned for our full performance test and review.